$14.047 million on 2075 screens. Hollywood is full of great Westerns – and Costner and company have seen them all. And while Open Range doesn’t add much to the genre, it definitely pays homage to it by serving more as a tribute than an embarrassment. However, watch it long enough and you’ll also realize that the film is more than a tribute to a genre – it’s a tribute to a man; namely Kevin Costner. He envisions himself as the modern-day embodiment of Gary Cooper in High Noon or John Wayne in The Searchers or as famed director John Ford in anything. Open Range serves as Costner’s rehabilitative opus; the project in which he envisions himself as bigger than the film itself and for all of the unintentional hilarity in a Costner vanity project (anyone recall 1995’s Waterworld or 1997’s The Postman? ), the last time Costner helmed a western was 1990’s Dances With Wolves and for his efforts, he took home both the Best Picture and Best Director Oscars. However, a lot has changed in thirteen years and Costner has found himself a very hard star to market. 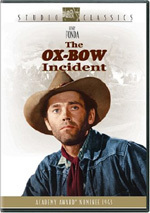 The film opens in 1882 and we meet four cattlemen – known as “free-grazers” (cattlemen who herd their stock on the open countryside without having any land of their own) – who are foraging their cattle on the absolutely gorgeous Montana plains (Alberta, Canada doubles once again as the American West). 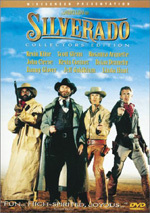 In short order we meet “Boss” Spearman (Robert Duvall), the hardened and grizzled leader of the group; Charley Waite (Kevin Costner), Boss’ quiet and reflective right-hand man with a mysterious past; Mose (Abraham Benburi), a gentle giant with a heart of gold who serves as the dumb muscle for the group; and Button (Diego Luna) the tenderfoot/trainee. All coming from different backgrounds and walks of life, you get the sense that these men are all escaping something and the open range is the only place where they feel truly at home. One day, the crew sends Mose into a local town for some needed supplies. When he doesn’t show back up after a day or so, Boss and Charley start to worry and they decide to ride into town to find him. When they eventually find Mose, he’s locked up in a local jail having been beaten within an inch of his life. It’s there that the duo encounters local land baron and rancher Denton Baxter (Michael Gambon) and the sheriff in his back pocket, Poole (James Russo). From the ensuing conversation you get the feeling that free-grazers and their way of life is rapidly disappearing. The “new” West will be made up of land owners and ranchers like Baxter who buy up the land that men like Boss and Charley feel belongs to everyone. Open Range is a mish-mash of quality work and outright silliness that causes it to be inconsistent at times. The pacing of the film was a little too slow and deliberate for my tastes, but when the gunplay starts, Costner showed himself to be an able choreographer that can put together an impressive action sequence when need be. While Costner pays tribute to the old school by rehashing some old Western stand-bys in the film, he deserves some credit for defying certain conventions as well. That being said, the dialogue – and a couple of situations - were a bit corny and the film seemed unnecessarily long for what it was. All in all however, I feel Costner deserves a passing grade for his directorial work here. If anything, he should be accused of overreaching somewhat and rather than attempting to create a new entry in the “great American Western” category, maybe he should have simply concentrated on making a tighter and slightly shorter affair that had a more broad-based appeal. As it stands however, Open Range was still an enjoyable film in my book. Costner does quite well with his role and as expected, still seems very enamored with himself. It would have been interesting to see how someone else would have directed Costner on this role, but that’s not going to happen and it is what it is. However, you have to give him credit for making wise supporting role decisions as Robert Duvall absolutely owns his role as “Boss”. He plays it with a grizzled confidence and a subdued humor that reminds you just how much of an American treasure he is. Annette Bening rises above the formulaic role of the Old West “woman-in-waiting” and manages to exude an apparent strength and exuberance that transcends the rest of the town. The remainder of the cast is full of relative unknowns who blend in to the Old West background perfectly. In the end, Open Range is a film with some notable flaws, but not enough to keep you from ultimately enjoying it. Buena Vista’s Open Range comes to DVD in an anamorphically enhanced widescreen transfer in the film’s theatrical aspect ratio of 2.35:1. The wide scope serves the film well and the transfer itself is as gorgeous as the Alberta landscape it features. Costner and company definitely deserve major kudos for choosing and properly shooting such a pristine location, as does Buena Vista for their efforts. The image remains very firm and detailed throughout the entire running time of the film, although there’s a bit of grain and softness in spots that seems more intentional than anything else. The scenes shot during the daytime and dusk exhibited spectacular colors and hues, while the much darker nighttime scenes revealed excellent black levels and shadow detail. The film was properly balanced and contrasted throughout and allowed for very vibrant and well-saturated hues that never showed any intention of smearing or bleeding. Issues with Open Range were miniscule, as the master print seemed to be in excellent condition; just as it should be for such a recent film. The aforementioned grain was present, but never presented any major problems whatsoever. I also noticed a couple of quick compression artifacts, as well as a couple of miniscule specks (literally only two or three) on the print and that was about it. All in all, Open Range was a quality release from Buena Vista and fans have every right to be pleased with the studio’s efforts. The film gets a pretty impressive audio transfer from the studio as well, as Open Range has both Dolby Digital and DTS 5.1 mixes. The soundtrack is well-authored and designed and while not the most aggressive and grandiloquent track out for a Western, Open Range succeeds wildly in its more quiet and ambient moments. It’s actually a rather subdued mix with superior environmental surround usage (high winds and rolling thunder storms, wagons, various horse and cattle noises) and the occasional bombastic moment (gunfights and the like). The entire affair is crisp and intelligible, with no one element ever overpowering another. It’s balanced perfectly and everything from the dialogue to the effects to the score are very clean and effective. Gunfire, as well as effects in general, ring true, as does the dialogue, and taken as a whole, Open Range was a very pleasing auditory affair. The front surrounds get the majority of the workout, with the rears providing excellent ambience and solid reinforcement during many of the more active scenes in the film. Bass response in Open Range was very impressive and strong, but never overpowering, allowing for a pleasing balance throughout the film. The score, orchestrated by Michael Kamen, was always appropriate and emanated very rich and warm at all times. In my opinion, the DTS track rings a bit more true than its Dolby Digital counterpart and if needed, Buena Vista has included a Dolby 2.0 mix in French, as well as English Closed Captions and Spanish subtitles. On the first disc, we find an Audio Commentary from director and star, Kevin Costner. Covering a lot of the same ground found in a documentary later on the disc, Costner goes on and on and on and on about the film and the trouble he had bringing it to fruition. We hear about the tight, almost non-existent budgets, the pains of securing financing, the difficulties of shooting in harsh and remote conditions, casting, set design, and so on. We get a ton of information on Open Range and while interesting, you get the feeling that if he could, Costner could talk about the film … and himself … for literally hours on end. Even so, what we’re left with is a very informative and insightful commentary and fans of the film will learn much from its contents. Disc one also gives us the option to Register Your DVD with Buena Vista, as well as some Sneak Peeks for Hidalgo, Veronica Guerin, Cold Creek Manor, The Haunted Mansion, ESPN (nothing more than a quick commercial for SportsCenter), and Alias. Moving on to disc two, we find a beautiful documentary entitled Beyond Open Range (65:49) that is hosted and narrated by Costner himself. Broken down into multiple chapters (“Beginnings”, “Preproduction Challenges”, “On Location”, “First Day!”, “Weathering The Elements”, “Wardrobe And Stars”, “The Realism Of A Gunfight”, and “A Film Is Finished”), or played as one continual documentary by using Buena Vista’s very welcome –PLAY ALL- feature, we get a fantastic look at what it took to bring this project to the big screen. Costner opens up and talks about the struggles it took to get the film made, as it was done essentially outside of the studio system. He discusses the difficulties of securing funds (from often shady characters) to get the film made, the strains of doing pre-production on the film without the comforts of an office (Costner and the principals used his home), the scouting of locations in Alberta, the emotional strain of not having a distributor during much of the pre-production and shooting process, and so on. We also get front row seats as the crew scouts and builds the western town used in the film and how budgetary constraints affected all aspects of production. We see events transpire on the first day of shooting and later on, how Costner’s undiagnosed appendicitis (and even laryngitis) affected his attitude on the set. Costner speaks lovingly on his co-stars and when it’s all said and done, there’s really not a whole lot Costner doesn’t cover in this very exhaustive and thorough documentary. If you’re even slightly interested in how Open Range was made, viewing this documentary is an absolute must. While Costner comes across a bit too self-absorbed, arrogant, and pauper-like during the early goings of the documentary, I still admire his love and resolute desire to make films that he feels strongly about. While it could be said that most of his films seem to be nothing more than vanity projects, there’s no denying that Costner has quite a few good films under his belt and I consider Open Range one of them, even with its many faults. Ultimately, Beyond was a well put together documentary that gives viewers an impressive look behind-the-scenes at the making of Open Range. Its mixture of interviews, narration, and behind-the-scenes footage makes it a real winner. Next up is America’s Open Range (12:43) and here we get a bit of background and history on the real open range, the American West. Narrated by Kevin Costner, we get another really good documentary that while short, provides us with some really good information on the territory, the harshness of the life it created for men and women alike, and even get some information on many of the real life characters it produced. I’ve read plenty of books on the American West and spent as much time as my job will allow in Montana (Thanks Craig and Dena!) and Wyoming and I would encourage each and every one of you to study up a bit more on this incredible piece of American history. A smattering of Deleted Scenes follow and we have the option of viewing them with or without an introductory video comment from director and actor Kevin Costner. Costner, never at a loss for words, offers up some good comments on the scene we are about to view and after viewing them, it’s pretty easy to see, or at least understand, why these particular scenes didn’t make the final cut. Again, we have the option of a –PLAY ALL- feature, or we can choose the scenes individually which include; “Send Mose To Town” (1:45), “River Campfire” (3:03), “Tracking Mose” (3:42), “Mose’s Story” (4:21), “Watching From Jail” (1:51), “Toss Jail Keys” (1:29), “Wife & Child” (2:21), “Rip It Down” (1:24), “Charlie With Dead Men” (1:29), “Baxter Kills Bill” (3:47), “Livery” (3:10), and finally, “Cemetery” (2:34). (FYI - All running times include Costner’s intro.) 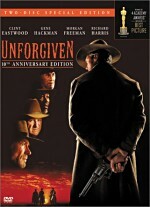 A nice addition to the Open Range set, there were a handful of scenes included that were hit or miss, without any real standouts one way or the other. Finishing off the disc we find Storyboarding: Open Range (6:36); a quickie supplement that shows us the processes involved in storyboarding the film. While a nice supplement, we’ve all seen a million of these types of documentaries by now and it really offers nothing new to the storyboarding discipline and what we already know about it. Lastly, we find a Music Video for “Broken Wagon” that is presented in fullscreen and Dolby Stereo 2.0. When it’s all said and done, Open Range was a good film. Not great, but very good and worth the rather lengthy investment of time it takes to get through it. While, in my opinion, Costner made the film a bit too contemplative and moody, it’s still a cinematic gem in its own right. It tries a bit too hard to become an instant classic, but to me, that’s not an entirely fatal flaw. Buena Vista has given the film excellent DVD treatment that contains a gorgeous transfer and a very atmospheric and moody audio mix that will impress fans of the film and fans of well-authored DVDs alike. If you’re a fan of the Western genre or the principals of the film, I feel that you can’t go wrong with a purchase of Open Range. However, those only remotely interested in the subject-matter or the genre might want to pass on this one and rent it over a rainy weekend.